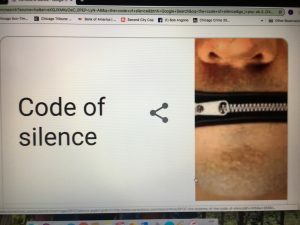 The Blue Code of Silence, anybody especially in Chicago who hasn't heard the term either has been out of the Country or has been living in Walden Pond for many years. 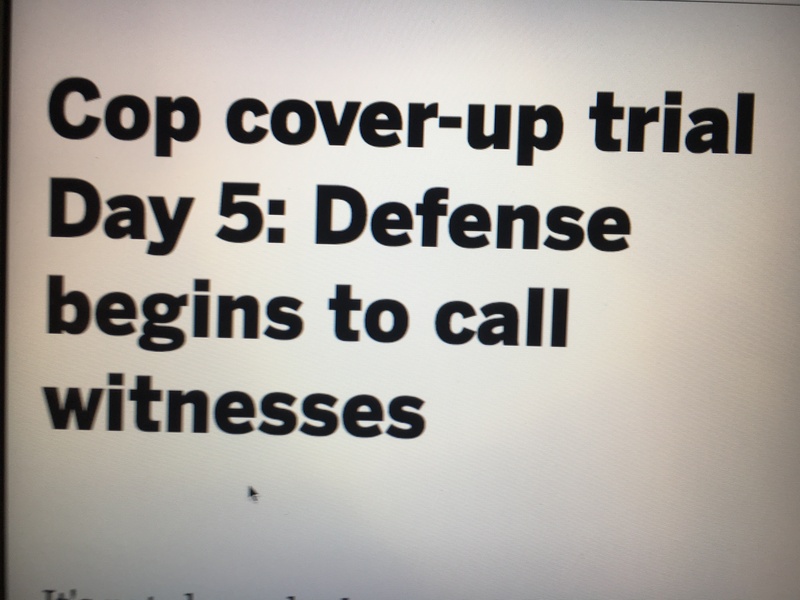 Since the shooting death of a black teenager by a white police officer on October 20th 2014 the accusation's of a police cover up have been a daily staple in Chicago. Indeed right now 3 Police Officers are on trial today, accused of trying cover up the details of the shooting. The question for many seems simple, who do you believe the released video or the officers who were on the scene? In the real world most folks would agree that honesty without question should trump loyalty. However as we all know as human beings to seemingly betray a partner, a loved one or friend is a gut wrenching decision. To be perceived as disloyal, or to be called a rat or a snitch leads to that feverish decision, loyalty or honesty." For Cops it's even more of a decision because turning in a colleague or a partner who sometimes holds your life in their hands just adds to the pressure. The Code of Silence is a condition in effect when a person opts to withhold whats believed to be vital important information either voluntarily or involuntarily. The code of silence is usually kept because of the threat of force or danger to oneself or being branded a traitor or an outcast within the unit or organization. Certainly we can all see justification for silence by neighborhood residents who are subjected to gang thug intimidation because of the threats to themselves and their families. They certainly face much more than be branded rats or snitches. Most Cops I know can look to the famous case in New York when New York City cop Frank Serpico exposed fellow officers in massive corruption schemes. He ultimately survived but he was shot in the face in the line of duty when his calls for help were ignored by fellow Cops.This does not excuse being silent it's just another level law enforcement officers have to consider. However if we are ever going to solve the problem of the Code of Silence it simply must be dealt with across the board and not just what is called the low hanging fruit. Three Police officers are on trial and charged with the conspiracy to cover up the details of the shooting. Police Superintendent Johnson has since recommended that 7 officers be fired for their involvement and a Lieutenant and a Commander who adjudicated the shooting one day after it occurred have both retired to enjoy nice pensions. Mayor Emanuel and the entire City council voted to award the supposed victims family 5 million dollars. It's inconceivable to me that a Mayor or a City Council member doled out 5 million dollars without seeing the video of that incident. They say they did not. Also every single Command officer who signed off on that shooting concurring with the Officers reports should have or did view that video. By not releasing the video before the election I agree, caused The Mayor not to seek a 3rd term.Most people think that was a heavy price to pay. Indeed my question is why aren't scores more on trial? If the video is conclusive evidence of a massive cover up why do we not have massive charges being brought? To allow Command and political personal to skate so to speak will just leave them in their positions to continue business as usual. What kind of message is being sent by allowing them to wiggle off the hook? Leadership starts at the top and that means the top bears responsibility. The entire City of Chicago deserves better leadership. One officer was convicted of 2nd degree murder and Aggravated battery, 3 others are on trial, and seven more have been recommended for separation. Not one of them above the rank of Sergeant. The stench is to much to bear.